Windows Essentials Codec Pack is a collection of audio and video DirectShow codecs and filters. With Windows Essentials Codec Pack you should be able to play 99% of all movies and music files that you download off the Internet, stay up to date with the latest codecs with the Audio/Video Codec Update Service, and eliminate the many conflicts and errors caused by using multiple codecs to decode the same file types. Windows Essentials Codec Pack is designed as a user-friendly near complete solution for all your video and audio needs, with it you can play audio CDs, DVDs, (S)VCDs, and XCDs on the fly, and it adds support for 3GP, AAC, AC3, APE, Windows AVI (*.avi), DivX, 3ivx, DAT, h.
For security reasons, you should also check out the Windows Essentials Media Codec Pack download at LO4D.com which includes virus and malware tests. Additional screenshots of this application download may be available, too. Windows Essentials Media Codec Pack has a presence on social networks. 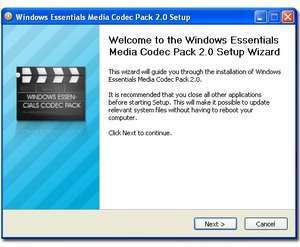 Windows Essentials Media Codec Pack download been highly rated by our users.